We’ve been incredibly lucky and are grateful to have received considerable press over the past year for all of the projects that we get to work on with our great partners and collaborators. Among others, there are the articles about the formation of The Department of Making + Doing, the numerous pieces covering our Tiny WPA project at Smith Playground and WHYY‘s coverage of Camp Crescent. But amongst these and many more, five in particular stand out for doing a great job explaining some of the work that we do, the impact that we have and most importantly, for celebrating the young adults who do great things in these projects. Architect Magazine does a great job of succinctly describing the unique #TinyWPA process and the logic behind it’s design. We love that the Flint Journal gives an intimate, on-the-ground view of a #TinyWPA project in-process and they took a lot of time interviewing the teen participants and some of the community partners. 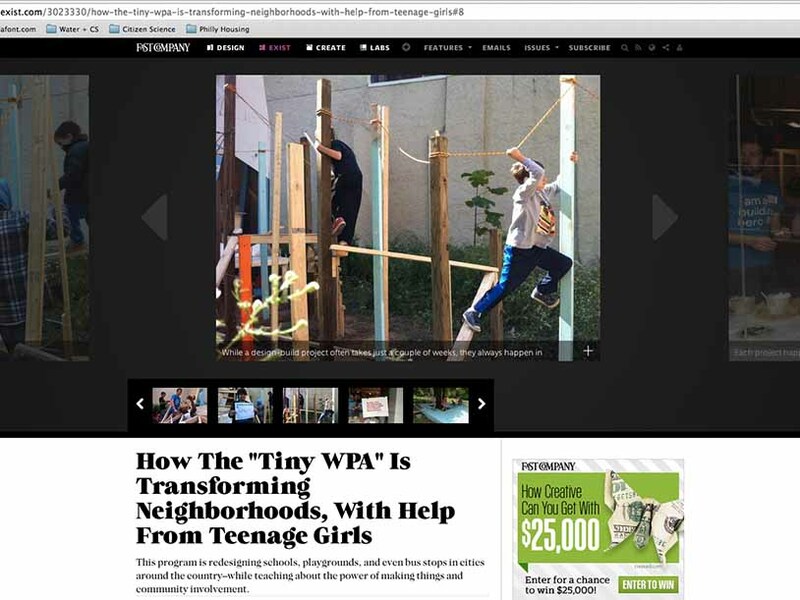 We are so thankful to Fast Company and Adele Peters for giving truly national visibility to our #TinyWPA projects, particularly the incredible things that happened when we gave ten young ladies power tools on the South Side of Chicago. Flying Kite describes the many experiences, years of work and insights that underpin #TinyWPA. PBS/Edutopia followed Alexa–one of our 16 year old Building Heroes–throughout a #TinyWPA project, documenting the impact that these types of projects have had on her. Alexa is fantastic and it made our year to see her in the limelight. Thank you to Good Magazine, Metropolis Magazine, The Philadelphia City Paper, Grid Philly, Technically Philly, Arch Daily, Philadelphia Magazine and others for supporting us and the many teens and collaborators that we worked with in 2013.